"Arms and the Man" is early Shaw -- which means it can sound a lot like late Wilde. Later, George Bernard Shaw would take up the cudgels against the hypocrisy and false idealism he saw everywhere around him, but here he sticks to lighter weapons: a fencing foil, say, not a sledgehammer. That can fool the unwary into failing to take Shaw's arguments seriously. But Spiro Veloudos, in his sprightly staging for the Lyric Stage Company, helps the play's delicate barbs land with deadly accuracy. This "Arms and the Man" is light -- but light as in artillery, not souffle. A brief musical overture, arranged and conducted by Jonathan Goldberg, sets just the right tone of bombast deflated. First comes the "Star-Spangled Banner," in all its pomp and glory, and then, in quick succession, a flock of other national anthems, each demanding attention for a moment and then merging into the next. The effect, as with Shaw's pointed undermining of feverish patriotism and romantic illusion, is to remind us that all these battling ideals are really the same misguided idea: the longing to believe that Our Country is right and everyone else's wrong. But even that sounds heavier than what Shaw is up to in this witty, ridiculous comedy about a foolish young lady and the "heroic" soldier she imagines herself in love with -- until a real soldier, war-weary and more interested in filling his stomach than proving his manhood, bursts through her bedroom window to save his skin. Lovely Raina is first appalled by his cowardice, then charmed and sympathetic, and then . . . well, that's the play. "Arms and the Man," like Shaw's "Pygmalion" and unlike any of his other works, inspired a musical adaptation. "The Chocolate Soldier" is no "My Fair Lady," but the title perfectly captures the confectionary, lightly ironic tone of the piece. So, too, does the Lyric's production, which skitters amusingly along the surface of Shaw's glittering dialogue, rarely slowing even when the playwright's love of argument leads him a little too close to the soapbox. "Arms and the Man" works most persuasively when it lets us forget that it's trying to persuade us at all, when it lulls us into thinking that we're watching a light romantic comedy. Only then does the point prick us -- and it's tipped with acid in Shaw's bitingly clear dismissal of romantic and patriotic ideals. Raina's "chocolate soldier," the fugitive, sweets-loving Swiss mercenary who invades her boudoir at a key moment of the now obscure Balkan wars of 1885, at first seems a little too stiff, more socially correct gentleman than astute observer. But as Barlow Adamson relaxes into the role, we're as charmed by his pragmatic disillusionment and good humor as is the young, impressionable Raina. 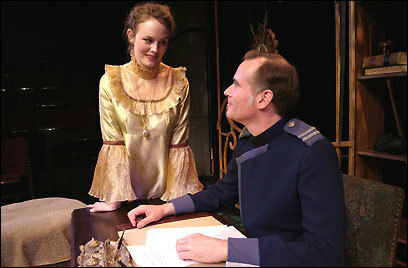 As for Raina, Ellen Adair makes her both foolish and adorable -- as she must be, if the play's to work at all. Initially her adulation of her affianced hero, Sergius (given a perfect air of glossy, mustache-preening absurdity by James Ryen) seems purely idiotic, but Adair gradually opens up the character to reveal unexpected layers of pretense and self-awareness. Raina has pretended to worship Sergius for so long that she believes her own act -- but she's also smart enough to see through it, and Adair, wonderfully, lets us see through it, too. Bobbie Steinbach and Ken Baltin provide expert comic support as Raina's aspiring bourgeois parents, infusing every line and bit of business with a delectable mix of silliness and bonhomie. Meanwhile, Sarah Abrams contributes an insolent, saucy turn as Louka, the ambitious maid who distracts Sergius from his intended, and Peter A. Carey creates a wryly understated, quietly triumphant manservant in Nicola, who woos Louka until it's more advantageous not to. They're all handsomely costumed by Molly Trainer, the men in dark uniforms and the women in pastel peaches and olives barely shadowed by gray. That's just right: chocolate soldiers and their sherbet sweethearts, the sweetness cut with a splash of bitters. Directed by: Spiro Veloudos. Sets, Cristina Todesco. Costumes, Molly Trainer. Lights, John Cuff.